Nestled in between the rival Gyeongsang and Jeolla provinces, small traditional town of Hadong will gather lots of outsiders for the taste of unique aroma of mountain dew tea grown from the favorable forces oozing from beautiful river of Seomjin and majestic mountain of Jiri. Sponsored by Ministry of Culture and Tourism (MCT) the 9th Hadong Mountain Dew Tea Festival will be held from may 20 to 23, 2004 in villages in Hadong-gun (county), an origin of Korean teas and old kiln sites for stoneware bowls. The four-day tea feast will take place in Unsu-ri, Hwagae-myeon, Hadong-gun which is famous for the original home of Korean teas and in villages of Jingyo-myeon which is the old kiln site for stoneware bowl. The objectives of the four-day feast are to strengthen its sales competitiveness and thus boost its local economy by introducing Hadong's high quality mountain dew tea to foreigners as well as Korean nationals. In particular, the festival aims to spread Korea's unique tea culture to the world by showing and teaching tea manner and ceremony to Korean and foreign visitors. Famous local tourist attractions include majestic Ssanggyesa Temple, traditional open market place of Hwagaejangteo, and environmentally healthy and scenic Seomjin River swirling around Hadong county. Visitors will have a moment to pay a tribute to the memory of the birth place of Korea's green tea in special ceremonial rituals. Tea ceremonies by Buddhist monks will add flavor to the festival. Free taste of freshly harvested teas, tea making contest, tea leaves picking game are just a few examples of the accompanying events. Hadong's fame as one of the best producers of wild teas in the nation is ascribable mainly to its natural environment — porous land combined with clean air and water in the region. Surrounded by natural beauties of splendid Mt. Jiri and relatively cleaner Seomjin River, mountain dew teas cultivated in Hwagaegol or Hwagae Valley are favored by tea lovers for its uniquely deep color and tasty aroma. 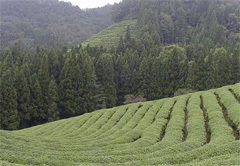 The difference of mountain dew tea produced in Haegye Valley and the other teas grown in the other commercial growing field is comparable to that of wild and ordinary ginseng. Wild ginseng roots can fetch hundreds times as much prices as ordinary ones. Local people believe that its profound and unique taste and aroma were due to the God-given environment. For instance, Hadong's mountain dew teas grow slowly in chilly mountains where the gap of daily temperature is huge and fog from Seomjin River controls the amount of sunlight. Clean water and fresh air from deep valleys of Mt. 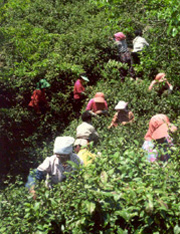 Jiri and porous earth containing full of oxygen are indispensable for teas growing into high-end mountain dew teas. 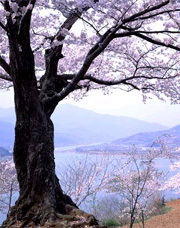 Representative of Hadong's various tea fields, Dosymdawon (Tel: 011-833-2251) boasts a time-honored mountain dew tree as old as a millenium years. The 4-meter high tree was designated by government as the oldest tree existing in Korea in 1996. The kiln village of Saemigol or Saemi Village was designated by government as cultural village that best shows traditional beauty of Korea. With its traditionally-built houses and surrounding bamboo trees the rustic hamlet became shooting site for a well-known local movie "Chiwhasun" or "Drunken Painter." The location for the Korean blockbuster is called "Baeryonri Kiln Site" where artistic genius Jang Seung-Up painted his masterpieces in the late era of Jeonsun Dynasty (1392-1910). The "rough and tough" stoneware tea or rice bowls fresh out of the traditional kilns are making visitors forget time and space in this unearthly place. As nation's one of the most famous kiln places during the late 16th century or early 17th century a variety of earthen wares — bundang porcelains, buncheong porcelains, white porcelains, inlaid white porcelains — were produced from this places until Toyotomi Hydeyoshi's Invation of Korea (1592-1600). Among the "idodawans" made in the areas are the ones produced in Gilsungdoyechon (Tel: 016-213-8386) or Gilsung Ceramic Village. 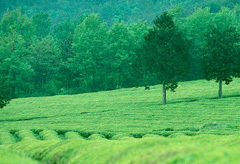 Together with Hadong's wild tea "idodawans" in the region represent the tea bowls of the country. Earth only from this area is used for the production. Experts say earth in the area can dissolve toxic elements in the tea leaves. The way from Hwagaechon Valley to Ssanggye Temple is the area where visitors can smell profound aroma of mountain dew teas. As large as 200,000 pyongs (660,000 sq. meters) of wild tea field are laying on the ridge of Mt. Jiri just past the Buddhist temple. 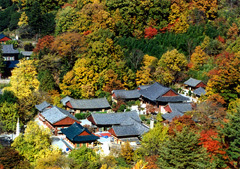 Traditional tea trees surrounding the Buddhist temple portrays traditional scenery of Korea. 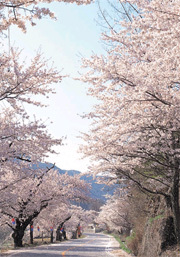 The lovely country road stretching 6 kms from Hwagae Traditional Market to Ssanggye Temple is lined with trees of cherry blossoms which are in bloom in April every year. Most village restaurants along the Seomjin River are selling special soup of "jaechop," a local name for a tiny black clam from the river bed. "Jaechop" soup is favored by binge drinkers for getting rid of hangover. It takes five or five and a half hour to drive all the way down to Hadong from Seoul on either Seoul-Busan Expressway or Chungbu Expressway. Once on either expressway change into Honam Expressway and when you arrive at Jeonju Interchange, take the road leading toward Imshil, Namwon, and Guryeup, before reaching Hadong. It takes six hours from Seoul to Hadong by train. They depart from Seoul Station for Hadong once a day at 11:50 p.m. Air flights leaves from Seoul's Gimpo Airport for Jinju, four times a day. It takes only one hour. Bus leaves for Hadong from Seoul's Nambu Bus Terminal five times a day. It takes roughly five and a half hour. For more information about the tea festival or Hadong by dialling 055-880-2373 or 02-737-5445. Ms. Oh Soo-Wha works for a public relations company specializing in international events. Ms. Oh studied in Annandale in Virginia. She also studied public relations and journalism at Yonsei University.